played on Tuesday, 20th August, 2002 at 7.45p.m. After Saturday's disastrous opening game of the season at home to Harrogate, Altrincham were looking for an improvement. Alty's last away game of last season was at Rivacre Park so this was, effectively, their second away game on the trot against Vauxhall, who won last year's encounter 2-1. Vauxhall came into this game after a 2-2 draw on Saturday at Stalybridge. This match was a vivid reminder of last season when Alty went three down inside half an hour to Frickley but this time the three goals to the opposition took only 19 minutes to arrive and Alty ended up losing 4-0 rather than 3-1, as on that occasion. In both games Altrincham belatedly settled down and last night at Vauxhall they enjoyed a good second half, although they did not seriously threaten the Vauxhall goal more than on a couple of occasions. The fourth Vauxhall goal, in the second of four "added on" minutes, was a cruel final nail in the Altrincham coffin. Injuries to Danny Murphy and Ian Craney, which saw both fail to complete Saturday's game and also ruled them out for this match, did not help Bernard Taylor in his attempts to kick-start Altrincham's season after their four goal drubbing by Harrogate on Saturday. Also missing for this game were the injured Vernum Rowland and Neil Ryan. Peter Band remained suspended but Neil Murphy came in for his first competitive game for Altrincham. Also making his full debut was Simon Woodford in right midfield, whilst Jason Gallagher started on the bench. Gary Scott returned after missing Saturday's game through injury but played in central midfield rather than his normal position at the back or in wide midfield. Neil Murphy took over at right back with Rose dropping to the bench. In the Vauxhall side was Derek Ward, the ex-Stalybridge right-back, who had been on pre-season trial at Altrincham. 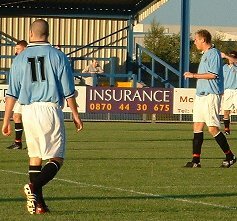 Altrincham took to the field in a new away kit of pale blue shirts, white shorts and black socks. The colour was apparently deliberately chosen as an echo of Manchester City's traditional blue kit. After changing round, so that Alty faced into a strong sun, possession was soon lost and within thirty seconds Cumiskey had won a corner for Vauxhall on their right. This was cleared but Hevicon then lost the ball and it was played forward into the right side of the Alty box where it bounced over Mark Maddox's head to leave Haddrell in the clear. He gave Stephens no chance as he drilled the ball home from close range after just 62 seconds. Vauxhall continued their bright start and won another corner from Stephens's punch after 6 minutes. Altrincham at last made a foray to the other end where Hevicon won them a corner. Thornley's first attempt at taking this was short but luckily it won a second corner for him and, this time, the move ended with Woodford shooting well wide (9 mins). Vauxhall's McDermott then headed wide at the back post as the chances continued to come in front of Altrincham's goal. Slowly, however, Alty began to get a toehold in the game with Hevicon making some runs, though these were as often across the pitch as forwards. When Hevicon was fouled on one of these runs, an Alty free-kick was headed by Talbot but was easily handled by Holmes in the Vauxhall goal. Then, just inside the Alty half, in the centre-circle, Mark Maddox lunged in at the advancing Nesbitt, who evaded the challenge and played a fine pass forward to Fearns who was in acres of space and not given offside. Fearns shot the ball past Stephens who, for the second time in the game, had been left totally exposed (15 mins). Straight after this, Cumiskey's cross caused danger but evaded both his colleagues and the Alty defence. It then got even worse for Alty when their defence stopped, presumably assuming offside, only for Fearns to stride on behind Adams on the right and go on to score again past a once-more defenceless Stephens. The young keeper had conceded three goals but had not had a chance with any of them. Altrincham's team of new faces were again slowly getting their game together when Talbot passed the ball to Haddrell, who set Fearns running at goal. He hit a very wayward shot but was given offside in any case (28 mins). McDonald was probably the pick of the Alty side in central midfield at this stage. Fearns then got the better of Maddox, who reacted by pulling back the Vauxhall man as he went past him, 40 yards out. Mark was booked for this offence (30 mins). Altrincham got in a rare shot after 31 minutes when Hevicon sliced his effort wide after a pass by Young. The pattern of giving the ball away continued when Adams lost possession to Haddrell and from Aspinall's subsequent deflected drive, a corner resulted on the Vauxhall right. From Nesbitt's flag-kick, Fearns missed a sitter at the back post, heading wide from close range (34 mins). At the other end Rod Thornley's harrying won his side a corner and he took it himself, short to Hevicon, but the wing-man promptly lost the ball. Play was now a bit more even but, even so, it took a recovering tackle from Maddox to intercept from Fearns who, in a good position, delayed his shot too long. The resulting Vauxhall corner was poor (40 mins). The half ended after an Alty free-kick for a foul on Adams, a punch clear by Stephens from a Fearns cross and, finally, a Vauxhall corner off Scott, which ended in an offside decision. Alty trooped off to the changing rooms three goals adrift. Altrincham were much better in the second half and started it off with a side-foot shot from McDonald, which was unfortunately fairly easy meat for Holmes in the Vauxhall net (46 mins). But Alty's flirtation with the offside trap again nearly cost them dear when Fearns once more got clear but his 30 yard shot was way over the top (48 mins). Stephens then caught a Vauxhall free-kick awarded for a foul by Woodford on Thompson. The match was now even, but the pattern was disrupted by six substitutions in fourteen minutes (56-70 mins). Firstly, there was a double switch as Rose came on for Adams at left-back and Gallagher replaced, somewhat surprisingly, Ryan Hevicon. Woodford switched to the left flank as Jason settled in on the right. Gallagher made an almost immediate impression going on an overlap up the right and from Thornley's pass he delivered a shot on the run which went just wide of the far post; this was by far Alty's most incisive attack of the game so far (61 mins). Almost immediately, Chris Young, who had a quiet game, gave way to Turner up front (61 mins). Then Vauxhall deprived Fearns of a possible hat-trick, subbing him by Welton (64 mins). Two minutes later Collins replaced Nesbitt for the Motormen. Then a good run by Cumiskey, who had a fine game, ended with Cumiskey's shot being deflected for a corner. Lawton then replaced Cumiskey to complete the substitutions (70 mins). Alty now looked more like business with Woodford beginning to get a bit of change on the Alty left and McDonald making some good passes from midfield. Gallagher too was making a difference on the right. The improvement culminated in a pass by Scott to McDonald whose well-hit, left-foot drive from 25 yards rose only narrowly over the Vauxhall bar (76 mins). McDonald then fed Rose, who won a corner for his side. At the back, Neil Murphy, Talbot, Maddox and Rose were looking a lot tighter than the back four had been in the opening stages. Indeed, Murphy put in a fine tackle to stop the tall and dangerous Welton as he threatened to get in on goal (81 mins). Alty were enjoying quite a bit of possession but Vauxhall's pace and control on the breakaway were always threatening. Gallagher and Murphy then combined down the right and from this Thornley went past two defenders and flashed the ball across the face of goal as Gary Talbot closed in on the Vauxhall goal (83 mins). But still a consolation goal evaded Altrincham. Surprisingly, Mr Stott found as many as four minutes of added-on time, presumably most of this being for the substitutions. In the second of these, Rose on the Alty left, played the ball back to Stephens after a call from the Alty keeper. As Haddrell bore down on him, the ball bounced off Stephens's leg, to his right, leaving Haddrell with an open goal which he did not miss (88 mins). It was a cruel blow after a spirited second-half revival by Altrincham. Nevertheless, there was still time for Haddrell to head over a McDermott cross before the final whistle put Altrincham out of their misery. Two games, two four-nil defeats, make up Altrincham's worse start to a season for years. The light in the tunnel is that the present side comprises many new players who can only improve as they learn each other's game. Up front, Altrincham continue to look light-weight, with neither Young nor Turner as yet proving to be an effective foil for the proven goalscoring ability of Rod Thornley. It was also encouraging to see Scott and Gallagher returning from injury and the news that Danny Murphy's injury last Saturday was not, after all, a fracture but ankle ligament damage, is also welcome. Nevertheless, Altrincham are going to have to get themselves better organised at the back soon if they are to climb up the table. The offside trap was breached several times last night and possession was given away cheaply far too often. Although at least one of the Vauxhall goals looked as if it might well have been offside, the home side also squandered two or three other good chances to score.